A MAN has been arrested for trying to sell an incredible number of African hunting ‘trophies’ in Mallorca. 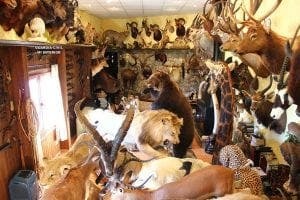 In one of the largest seizures of protected animals in Spain, some 69 hunting trophies were recovered from a finca on the island. When Guardia Civil officers searched the man’s house they found a whole room full of elephant tusks with pirate-era shooting pistols on the walls. “The trade of endangered animals is totally prohibited as they are at serious risk of extinction,” said a Guardia Civil spokesperson. According to the Convention on International Trade in Endangered Species of Wild Fauna and Flora (CITES) trading these animals is illegal. One elephant even had its foot cut off to be used as a stool, while an elephant ear had been framed. Stuffed bears, cheetahs, crocodiles, leopards, lions and even giraffes were also found – in a haul estimated to exceed €100,000. The man was trying to sell the contraband over the internet before Guardia Civil and Seprona agents stormed in.